We spent the past week learning all about conservation and did a few fun activities about it. 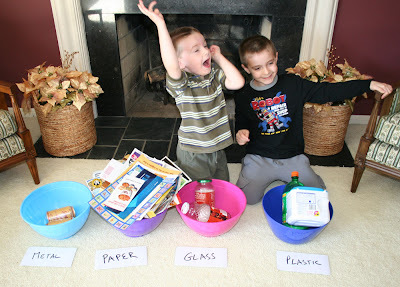 One, which the kids loved was sorting recycling. Can you tell they were excited about it? 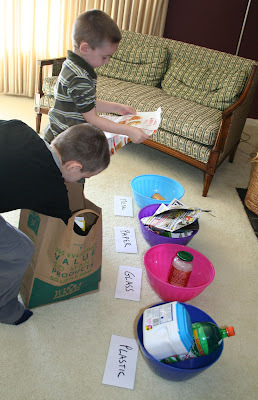 I grabbed what was inside our bin and let them classify the items. I have to say I was amazed how fast they were - I guess our green living is paying off! We also learned about what things can't be recycled or broken down (the sinister styrenes & plastic diapers) and what we do to avoid them (cloth diapers, reusable containers, etc.). As usual the local library was great for books. This one was great: Acting For Nature. It gave real stories of things kids have done to protect the environment. Very inspiring & shows how just a few young people caring about nature really can make a difference. We also did a fun experiment on water filtration. 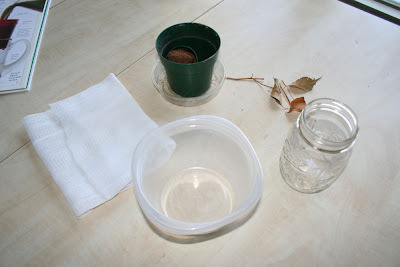 We gathered some containers, cheesecloth, a vented pot . 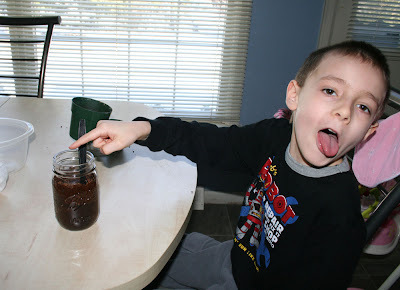 We made some "dirty water" by mixing soil & bits from outside with some water. Mmmmm, yuck-o! Then we folded up the cheesecloth inside the pot, put the bowl underneath and pour the dirty water in. Most of the dirt & debris got caught in the cheesecloth, so the water was much clearer. Obviously this does not make it potable (aka drinkable) water, but it does show how water gets cleaned and the value of keeping water sources as pollution free as we can. The best part with this topic is it's something we experience everyday and we're always learning more about it. Yay for a healthy planet!! That is a cool and fun activity! Oh I have a question for you...what kind of clothe diapers do you use? I have been thinking about switching, but don't want to use the walmart ones with a pin...I would probably stick my daughter too much with that! :) Thanks! Way to go! These are such fun ideas to help teach children. My kids go to pre school but I do extra teaching at home to make up for what public school lack. And it make a huge difference. So Im always open to finding new ways and things to teach my kids. 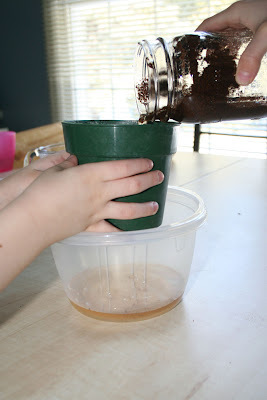 what fun way to teach kids about green living and our envronment! Came via SITs- i'm going to be following though!! Love the pic with your son's tongue out. It says so much :-) This looks like a great activity.